In this tutorial we will simulate a simple SMPS switching stage to demonstrate some of the more advanced plotting and waveform analysis facilities available with SIMetrix. Place the parts and wires as shown above. OR by pressing 'B' in the schematic editor. After placing the output probe, double click to edit its label. Enter Output in the box titled Curve Label. All the other options may be left at their defaults. For the pulse source V2, you can use Place > Voltage Sources > Universal Source or the Universal Source tool bar button. Double click V2. 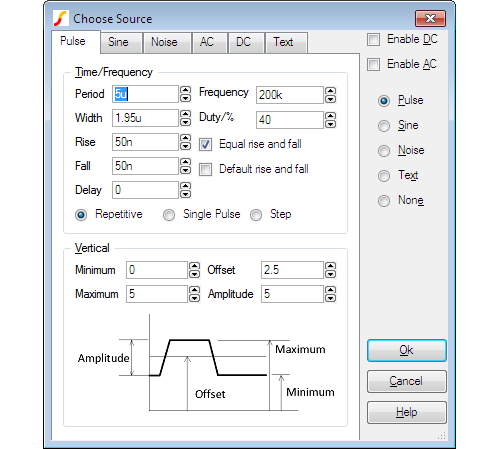 Edit the settings as shown below: This sets up a 200kHz 5V pulse source with 40% duty cycle and 50nS rise time. Set up the simulation by selecting the schematic menu Simulator > Choose Analysis.... In the dialog box, check Transient. Usually we would set the Stop time but on this occasion, the default 1mS is actually what we want. Now select the Advanced Options button. In the Integration method box, select Gear integration. 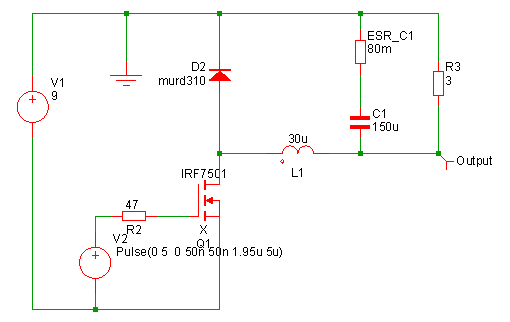 This improves the simulation results for this type of circuit. You will still get sensible results without checking this option, they will just be a little better with it. (For more information, see Simulator Reference Manual/Convergence, Accuracy and Performance. Select schematic menu Probe > Power In Device.... Left click on Q1. Zoom in the graph at a point around 100uS, i.e. 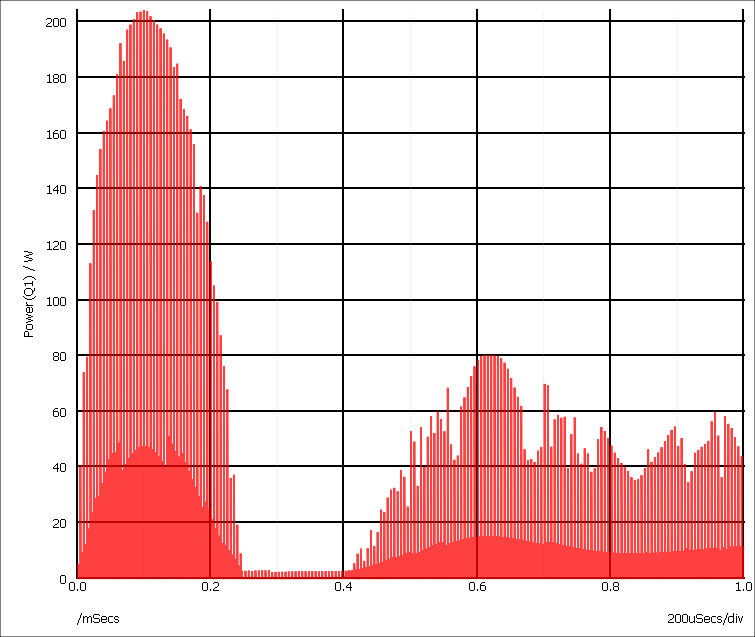 where the power dissipation is at a peak. Switch on graph cursors with menu Cursors > Toggle On/Off. There are two cursors represented by cross-hairs. One uses a long dash and is referred to as the reference cursor, the other a shorter dash and is referred to as the main or measurement cursor. When first switched on the reference cursor is positioned to the left of the graph and the main to the right. Position the cursors to span a complete switching cycle. There are various ways of moving the cursors. To start with the simplest is to drag the vertical hairline left to right. As you bring the mouse cursor close to the vertical line you will notice the cursor shape change. See Graph Cursors for other ways of moving cursors. 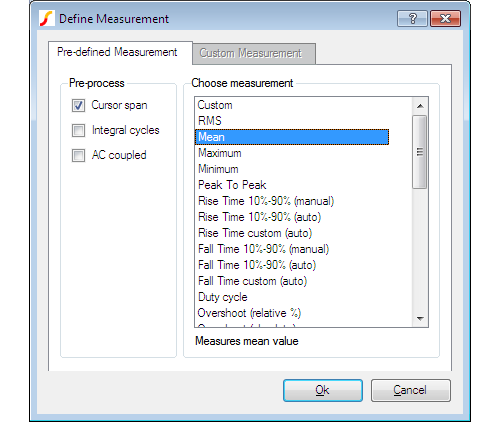 In the right hand pane labelled Choose Measurement select Mean. In the Pre-process group, select Cursor span. Click Ok to close the dialog box. You should see a value of about 2.8W displayed. This is somewhat more than the 517mW average but is still well within the safe operating area of the device. However, as we noted earlier, the inductor is ideal and does not saturate. Lets have a look at the inductor current. 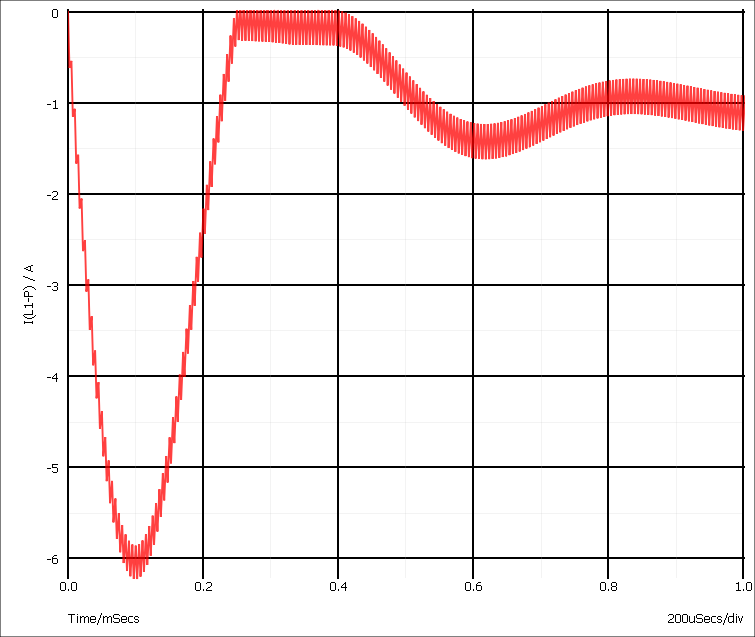 This shows that the operating current is less than 1.5A but peaks at over 6A. 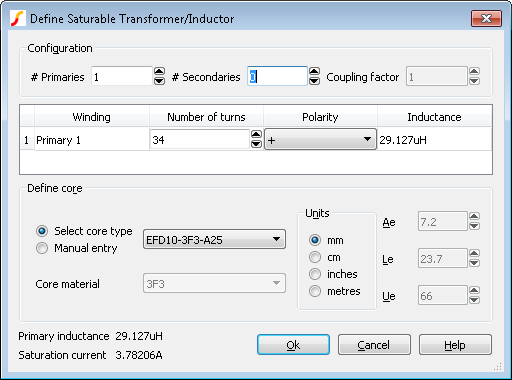 In practice you would want to use an inductor with a maximum current of around 2A in this application; an inductor with a 6A rating would not be cost-effective. We will now replace the ideal part, with something closer to a real inductor. Select schematic menu Place > Magnetics > Saturable Transformer/Inductor.... A dialog box will be displayed. (See picture below). Select 0 secondaries then enter 34 for the number of turns in primary 1. Next check Select Core Type. Select EFD10-3F3-A25. This is part number for a Ferroxcube ferrite core. This is what you should have: Click Ok to close the dialog box. Place the inductor in the same place as before. 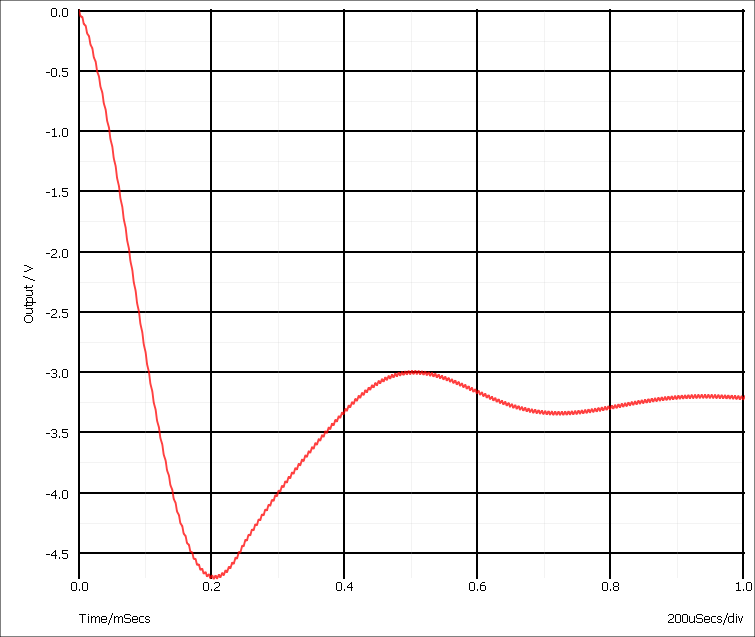 Select the graph sheet that displayed the inductor current by clicking on its tab at the top of the graph window. Now select schematic menu Probe > Current in Device Pin... and left click on the left hand inductor pin. Zoom back to see the full graph using the zoom button. Zoom in on the peak power. Position the cursors to span a full cycle. (The cursors are currently tracking the first power curve. This doesn't actually matter here as we are only interested in the x-axis values. If you want to make the cursors track the green curve, you can simply pick up the cursor at its intersection with the mouse and drag it to the other curve). As before, press F3 then select Mean with the cursor span pre-process option. The new peak power cycle will now be in the 11-12W region - much more than before.